User testing is a must both for game suppliers and igaming operators! Do you as a game supplier do user testing on your software? Do you as an igaming operator do user testing? I would argue that it is not an option not to do it! The reasoning for this is very simple: if a player can’t play they won’t play! But I would be surprised if many operators do user testing when they sign up new game suppliers. One example is game supplier Yggdrasil Gaming, a pretty new company who have been very successful in signing up new operators including Mr Green, Unibet and Leo Vegas. I am sure that Yggdrasil has some great games, but I believe they didn’t do their homework when it comes to their tablet games which I tried out when I visited ICE earlier this year. In image 1 below you can see the main game controls (Play, Max Bet and Autoplay) in the middle of the screen. This design looks pretty nice but it isn’t optimal when you play the game. Image 1. 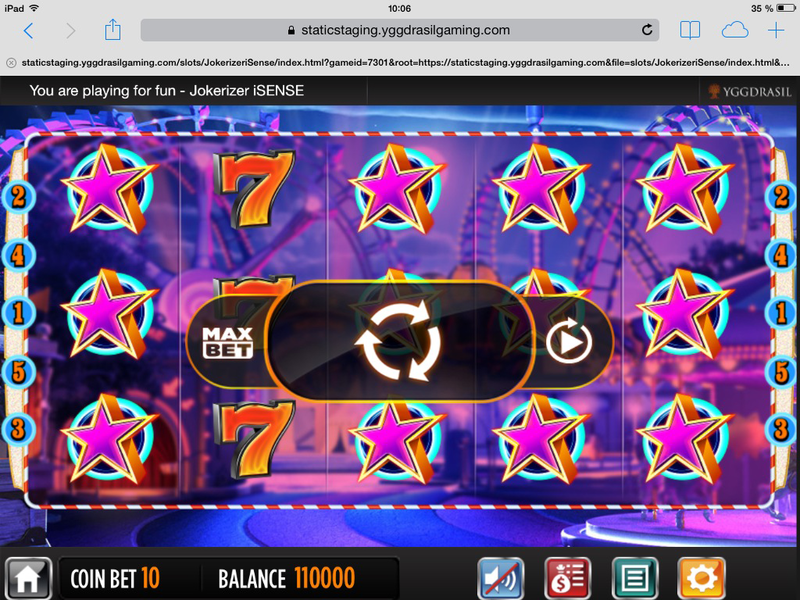 Yggdrasil’s video slot “Jokerizer”. Placing the controls in the middle makes the players have to move their hands a lot and reach for the play control every time they want to play. In the video below you can when I play on an iPad mini. The iPad mini is very small and it will be even more hand movement when playing on a larger tablet. Luke Wroblewski talks about this in his article, “Responsive Navigation: Optimizing for Touch Across Devices“. Image 2. Watch a video of a player (me) interact with the game on an iPad mini. So I think this is a bad solution when it comes to the player experience, and as an operator you need to consider this when you add games to your offering. The games are a part of your total gaming experience and every part counts! So my advice to game suppliers and igaming operators is to do user testing when you develop games as well as when you sign up for new games.